If you love nature and want to breath fresh unpolluted air and still be close to the city, this house is for you. 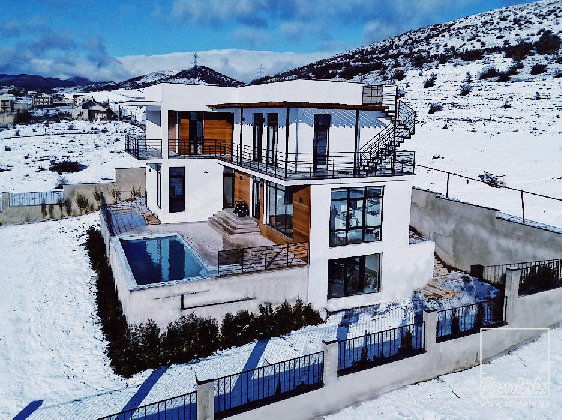 It has magnificent views on mountains and on Tbilisi, has a lovely terrasse with a swimming pool and a 1000m2 garden. Every detail in the house was designed by an interior designer. House is composed of: a lovely living room with a fireplace, a big kitchen with an island, 4 bedrooms (fully furnished, with individual balcony access), 2 bathrooms with 2 toilets, 1 separate toilet for guests, 1 laundry room and 1 utility room, and a big PLUS + basement with a bar (in the style of a mancave that can be used as a cinema or as a gym). The house is FULLY equipped (from high quality furniture till bed sheets and cutlery), your luggage is all you will need to bring.